What challenges do African refugees and asylum seekers face when they arrive in Israel? What resources are available to help? 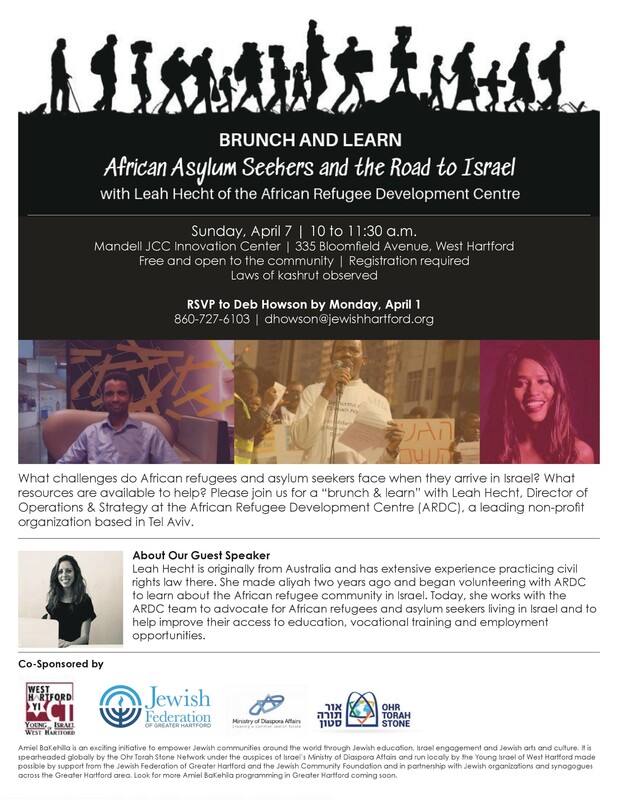 Please join us for a "brunch & learn" with Leah Hecht, Director of Operations & Strategy at the African Refugee Development Centre (ARDC), a leading non-profit organization based in Tel Aviv. Leah Hecht is originally from Australia and has extensive experience practicing civil rights law there. She made aliyah two years ago and began volunteering with ARDC to learn about the African refugee community in Israel. Today, she works with the ARDC team to advocate for African refugees and asylum seekers living in Israel and to help improve their access to education, vocational training and employment opportunities.